Indicates low air or gas pressures - positive, negative or differential. Accurate to within 2% with 81 ranges. Select the Dwyer Magnehelic gage for high accuracy guaranteed within 2% of full scale and for the wide choice of 81 ranges available to suit your needs precisely. Using Dwyer's simple, frictionless Magnehelic movement, it quickly indicates low air or non-corrosive gas pressures either positive, negative (vacuum) or differential. The design resists shock, vibration and over-pressures. No manometer fluid to evaporate, freeze or cause toxic or leveling problems. It's inexpensive, too. Widely used to measure fan and blower pressures, filter resistance, air velocity, furnace draft, pressure drop across orifice plates, liquid levels with bubbler systems and pressures in fluid amplifier or fluidic systems. It also checks gas-air ratio controls and automatic valves, and monitors blood and respiratory pressures in medical care equipment. Mounting. A single case size is used for most ranges of Magnehelic gages. They can be flush or surface mounted with standard hardware supplied. With the optional A-610 Pipe Mounting Kit they may be conveniently installed on horizontal or vertical 1 1/4" - 2" pipe. Although calibrated for vertical position, many ranges above 1 inch may be used at any angle by simply re-zeroing. However, for maximum accuracy, they must be calibrated in the same position in which they are used. These characteristics make Magnehelic gages ideal for both stationary and portable applications. A 4 9/16" hole is required for flush panel mounting. Complete mounting and connection fittings plus instructions are furnished with each instrument. In applications where pressure is continuous and the Magnehelic gage is connected by metal or plastic tubing which cannot be easily removed, we suggest using Dwyer A-310A vent valves to connect gage. Pressure can then be removed to check or re-zero the gage. Connections: 1/8"' NPT female high and low pressure taps duplicated - one pair side and one pair back. Housing: Die cast aluminum. Case and aluminum parts Iridite-dipped to withstand 168 hour salt spray test. Exterior finish is baked dark gray hammerloid. Accuracy: Plus or minus 2% of full scale (3% on - 0 and 4% on - 00 ranges), throughout range at 70°F. * Low temperature models available as special option. 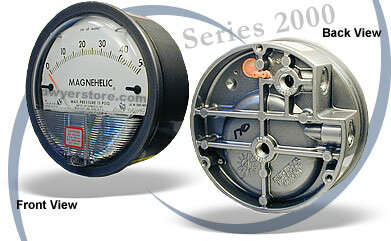 + For applications with high cycle rate within gage total pressure rating next higher rating is recommended. See Medium and High pressure options lower left.